I once had a fantasy of visiting ALL the farmers markets on Maui and writing a guide to them, but reality set in. There are certain areas of Maui – especially the West Side and Hana that I rarely go to, so the logistics of visiting them all, with my schedule and gulch terracing project, aka “the infamous chicken project” seemed daunting. BTW, if you're hopping from the A to Z Challenge, please feel free to skim and not read every sentence. So many farmers markets, so little time... But there's always tomorrow! The other issue is that farmers markets are a moving target on Maui. While some farmers markets are consistent and dependable, new ones form, old ones fade, some move or change names. It’s like diving down the rabbit hole. I would visit a new “farmers market” one week and the next month, they were closed. I’ve traveled enough to know that farmers markets are different everywhere. Outside Atlanta, there is a SUPERSIZED enclosed farmers market in Dekalb which has everything imaginable – from vegetables and fruits, to meat and seafood, to dairy products and hot deli items. Heaven! Stands are permanent with refrigeration and electricity. Items for sale are stored on site, not transported back home at the end of each day. So different from on Maui. "Farmers markets" to me imply more than one farmer or retailer selling to the public. "Farm stands" imply one seller or farmer who may also sell produce or items outsourced from other farms or suppliers. Farm stands are usually smaller. On Maui, the term “farmers markets” often include both farm stands and farmers markets so I'll use whatever the market or stand calls itself. They are not centralized. You’d think there might be ONE big farmers market for each area of Maui, like one for Central Maui, one for Upcountry, one for the South Shore, one for the West Side, but no. They mostly feature fruits and vegetables, but I have seen local venison for sale and heard of local pork for sale. I have never seen fresh fish for sale, maybe due to county regulations. Local eggs are readily available upcountry. A dozen eggs from “happy chickens” may sell for $6-8. Most farmers markets are outside, in the open air. There are notable exceptions. Most farmers markets have no refrigeration or electricity or individual vendors must provide their own electric power, like with a food truck. 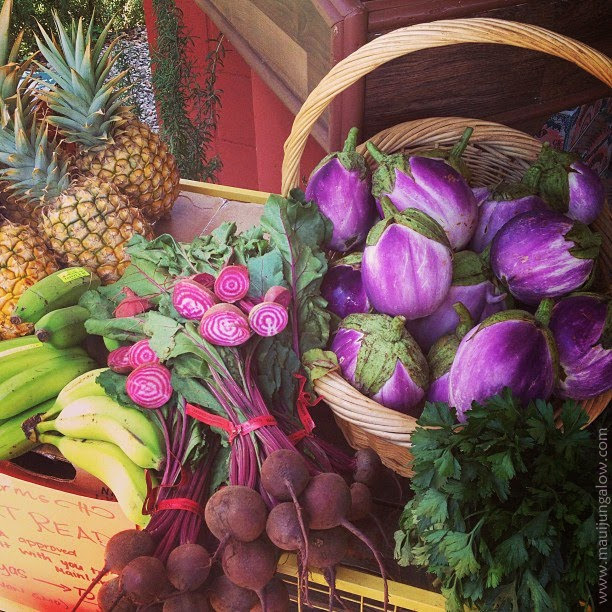 Farmers markets is a term used very loosely on Maui. Some farmers markets are more like a big farm stand rather than a marketplace of several farmers and sellers. Produce is sometimes inconsistent and variable. One market always had kale, until the day they didn’t have kale. Mangoes were in season so I thought I could get some mangoes at one place, but they didn’t have any. If the weather is really rainy, you may not find local cucumbers a few weeks later. Prices can vary for the same item from week to week. Maybe not all farmers change prices regularly or all markets, but some do. I bought cherimoya (a yummy tropical fruit) for a fantastic $2/lb one week and the next week, the same cherimoya were $4/lb. There are no evening farmers markets, not yet anyhow. All the markets I've visited are morning only, or up till 5 pm or so, with slim pickings later in the day. Just because they sell it, doesn’t mean it’s locally grown. For example, celery is often shipped from California to Oahu, then redistributed to individual sellers. So if you ask, where is this celery grown, and the person says it’s from Oahu, it’s probably not grown on Oahu. Oahu is not known for producing celery. Local does not mean organic. Green bell peppers grown on Oahu are usually commercially grown with conventional fertilizer, pesticides and growing methods. Some produce is not fresher than in the grocery store. It depends on the booth and when they picked or shipped their produce. Lettuce can wilt if it’s been sitting out all day, even under shade. On the other hand, some farmers pick their produce the night before and present the freshest goods. Quality varies at different markets. “Blemished” produce does not mean poor quality. Lilikoi or passionfruit can get wrinkled or spotted as they age, but the older ones are usually sweeter than shiny smooth skinned lilikoi. Although a squishy tomato is still… yucky. Farmers markets are less expensive than the supermarket. Well, sometimes they are, and sometimes they aren’t. It depends on what’s available and which market you go to. Farmers markets sell what is in season. At some markets this is true. At other markets that import produce, this may not be true. Not all farmers get along. Say what? That's one reason - but not the only reason - behind the multiple markets. 1. Ethnic farmers markets with goods that appeal more to locals or Asians and Pacific Islanders. They may have standard supermarket produce like zucchini, celery, tomatoes, kale, Swiss chard, but will also have a good range of ethnic produce and tropical fruits. Items will include exotic moringa seed pods, catuday flowers (to eat), calamansi citrus fruits, asian greens, banana flowers, plantains (cooking bananas), gobo (burdock), long beans, taro stems and roots, chayote or pipinola, Okinawan squash or opu, winged beans, and other really unusual fruits or veggies, and Filipino desserts and sweets – like bibingka. These markets do not sell fresh meat, fish, and almost never eggs. You may hear Ilocano or Tagalog spoken here. They may resell produce from the mainland or other islands. Organic and local are not the most important concerns here. Produce may be cheaper than at the supermarket, but not always. 2. Boutique and organic farmers markets almost always have standard grocery store produce and tropical fruits, but will also feature local raw honey, soaps, tempeh, vegan cheese, candy, organic eggs from happy chickens, preserves, pastries, smoothies, fresh pressed sugar cane juice, chickpea miso, poi pounding boards, baklava, organic quiche, dehydrated flax crackers, sourdough bread, fresh flowers, vegetable starts, baby fruit trees, orchids, flower boquets, lunch entrees. These markets are mostly vegetarian, but I have seen one venison booth and heard of local pork for sale. I don’t recall seeing fresh fish for sale. Prices tend to be higher than in the supermarket especially for specialty goods. Produce is almost always locally grown. 3. Tourist farmers markets or fruit stands that sell fresh produce especially tropical fruit, like pineapples ready to ship, and sometimes jams and jellies, sandwiches, locally made banana bread, smoothies, juices, souvenirs. Almost always local produce only. Fresh drinking coconuts are often for sale, along with demonstrations of coconut cutting. Prices for some items may be high to very high. My husband has been to known to have a conniption. One of my favorite farmers market pics. Kumu Farms Farm Stand at Maui Tropical Plantation. But some farmers markets may be a combination of the three categories above, and appeal to different demographics. Or a market may be primarily one category with a couple of booths belonging to a different category. TJs Farmers Market (youtube video only) - still going strong, good ethnic market. There are other markets in Maalaea, Kihei, Olowalu, the West Side, Hana and the Swap Meet. As I said before, farmers markets are a moving target. My other favorite farmers market picture. April is so photogenic. Anyhow, maybe one day I’ll write a guide to local farmers markets, but in the meantime, I am working on my next blog post for tomorrow!